Thirty five years later, I look back upon the music produced by the Terminal Sunglasses with much pride. I am also still impressed by how much press we got and how well our music was received critically (see charts and reviews), considering how amateur we actually were. Clearly, our talent lay as much or more in creating hype as it did in songwriting. How many bands can claim that Frank Zappa went on MTV to introduce their video in which Leonard Cohen appears (check out Psycho Rail on the video download page)? How many bands can claim to have been banned from Much Music for making fun of Much Music in their video (check out Antennae Dilemma on the video download page)?? How many bands can claim that their equipment was stolen from their practice studio not once, but twice in the same year? 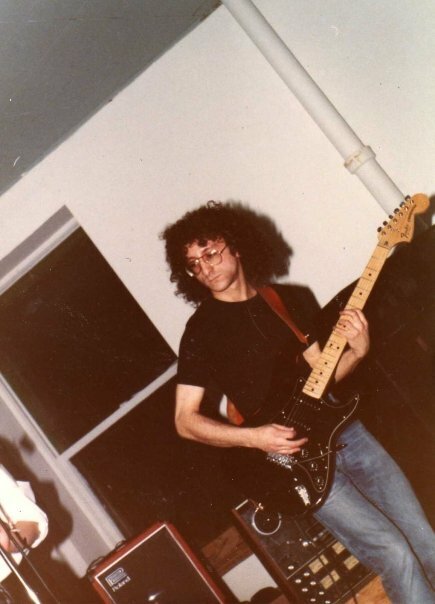 OK, maybe that last point is pretty common in the garage music biz, but I wanted to add that if anyone sees an early 1980's all black USA Fender Stratocaster with maple fretboard (see above pic) that has two small modified phase switches built into the front panel, it's mine, and I would appreciate having it back. Creating this site brought back many pleasant memories. For the first time in decades, I pulled out my old live tapes and listened for the gems (ha! ha!) worth posting here (see posters page for free mp3's, available for the first time ever). Yes indeed, those were the days.